Looking for new or used Dell Rack Systems to buy or sell, Vibrant Technologies is the leading dealer globally in remarketed Dell Rackmount servers. We can custom configure a Dell PowerEdge Server to meet your needs or spec and ship you the exact part or upgrade that you need to optimize your system. 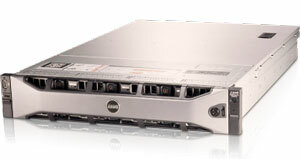 We also carry an extensive inventory of server rails to rack your current Dell server. Please request a quotetoday or contact us with any questions or equipment for sale. Dell 0GM671 Poweredge 1950 GEN II Rackmount Server Chassis 2.5"
Poweredge 1950 GEN II Chassis 2.5"
We have pallets upon pallets of Dell rackmount servers in our warehouse from 1U "pizza box" systems to 8U rackmount blade servers including complete rail kits, rack ears, face plates and the accessories and features you need to fill your server racks and data center. We can custom configure any server or multi-server installation to meet your application needs or business requirements. We also pay cash for for your excess Dell rack servers and can handle the asset recovery and data erasure of your systems, while cutting you a check. Just send us your equipment list for a bid!